After reading your bassline equalisation advice, I’m curious because of the different harmonic positions relative to the note frequency, if you have a baseline that changes notes, should you / would you gain any benefit from having each note on a unique track with separate EQ, or automating the EQ to respond based on the note sequence? Or is that just overkill? To EQ or not to eq each individual note depends on the genre you working on and the results you’re aiming for. Now I would like to share some tips on how to use different bass notes with each individual EQ. 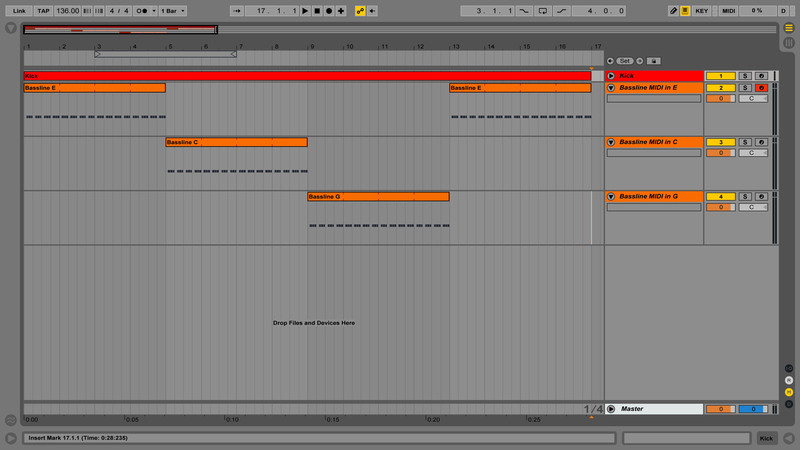 First of all, having several MIDI channels with different bassline notes is certainly an overkill. For every tiny change in the bass sound you would need to change it manually on the other channels as well. It’s also not convenient working with MIDI that way and not efficient for the computer resources. A good solution that I’ve been personally used for years is using resampling. 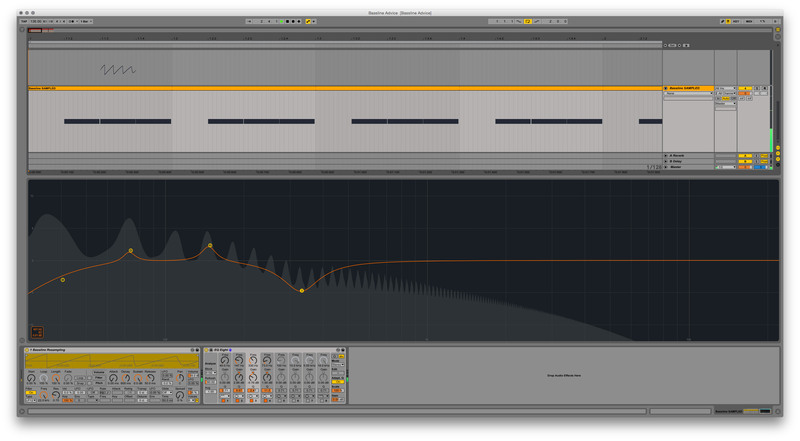 Just put an EQ on the bass channel, resample that one note as a piece of audio. 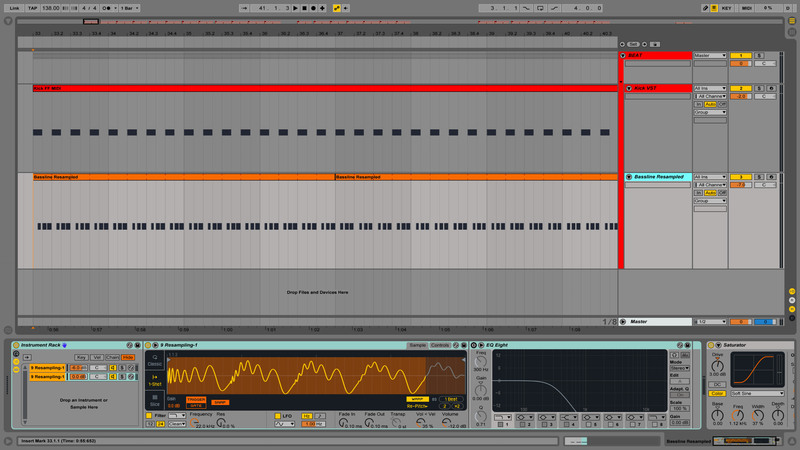 Then put an EQ with different settings for another note, resample it. And repeat for any other notes. I know it sounds like a huge amount of work when you read it, but in fact, it takes just a few minutes tops if you know your DAW well. First things first, make sure to use a proper kick sound in the first place whether it’s taken from a sample pack or you making your own sound from scratch. Psytrance sub-genres has very strict sub-standards on that matter, you can’t make a Progressive-Psy using a Goa Trance kick, neither make a Darkpsy using Full-on kick: they all have different transient, pitch, body, length, and overall character. 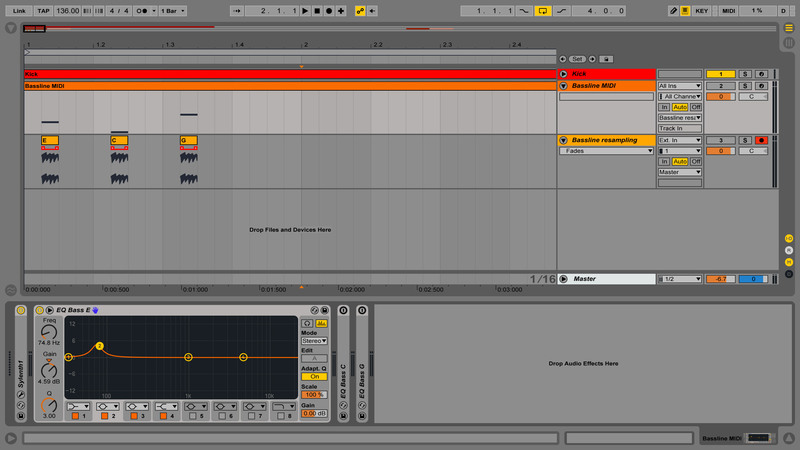 Another crucial thing is the mixdown, or simply the volume balance of kick and bass relative to each other. Although bassline plays a very important role in any Psytrance track, kick drum is actually the loudest element. To be more specific, I would suggest setting your kick drum level at 2-3 dB higher than the bassline. At last but not least, the EQ. 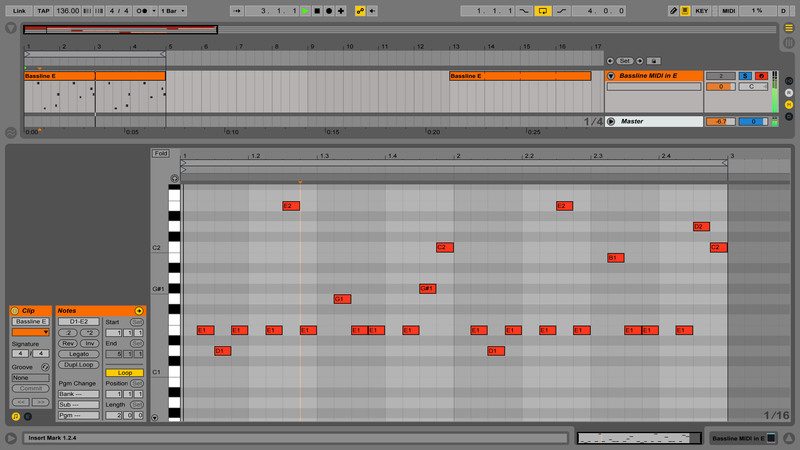 Usually I gently cut the kick at the frequencies of the key bassline harmonics. Let’s say, we have a bassline in A, which means its harmonics would be at 55 Hz, 110 Hz, and 220 Hz (in 440-tunning). In this case, I would slightly cut these frequencies from the kick to give bassline a little bit more space in the mix, just –1-2 dB with a narrow bell-filter. Sometimes I also use Ableton’s built-in Glue Compressor on the kick and bass group to slightly “glue” them together, but compressor is a tricky device that can easily ruin your sound, so I wouldn’t recommend doing that unless you know what exactly want to achieve with it. That’s pretty much it. You can hear the outcome in my productions. Fellow producers, how do you fit kick and bass together? Post your routine in the comments box below. Another question about basslines I’m afraid. With Psytrance almost being defined by the “KbBB” bassline, it seems to be one of the most asked subject for questions. Mine is quite specific. How do producers get the punchy attack on a bassline? No matter what I try, mine always seem to lack the initial punch of tracks such as Major7 & Vertical Mode – “Majormode” or Helber Gun – “Enlight”. Is it layers? Is it EQ? Is it a specific VST? Is it just down to ADSR envolopes and filters? I’d love to know how to get that sound with either Spire, Sylenth, Hive or Serum. Hamish, I don’t know for certain how Major7, Vertical Mode, or Helber Gun doing their basslines, but I have a couple of tips that might help. Before putting a complex chain of compressors, equalizers, and other devices, I suggest checking your sound patch in the first place— oscillator’s phase to be more precise. On EQ, cut the “mud” area around 300~500 Hz with a Bell filter and gently boost the highs. It would give you extra clarity and some sort of punchiness, too. I’ve written an advice about bassline equalization, be sure to read it as well. Saturator, Phaser, and various transient shapers are more considerable options for making your bassline more punchy. Keep in mind that these tools can also ruin your sound, so be gentle with its settings, don’t push it too hard. Especially Phaser since it messes up signal phase. Layering can help you with that. 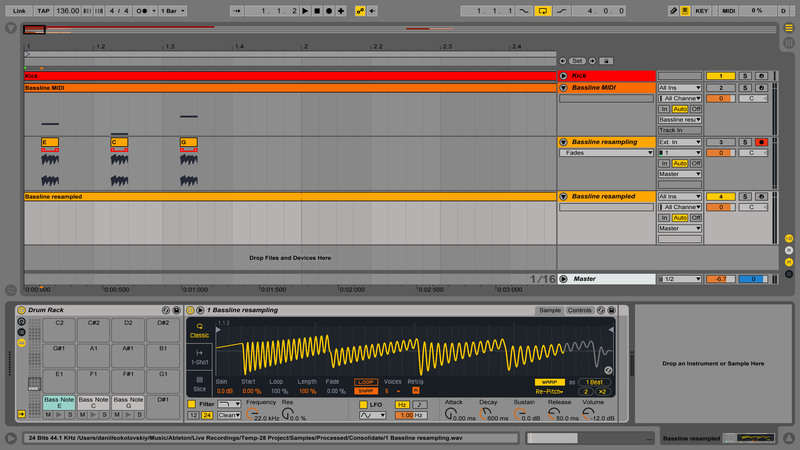 You can make one bassline layer with a High-cut filter to make solid and consistent base, and then add one more bassline, this time with a Low-cut filter and extra processing such as Phaser. This way your low-end spectrum won’t be affected, hence it keeps the bassline pressure while adding punchy mid-highs. The difference is subtle, yet huge. You can download these samples to your computer (right click on the play button → “Download linked file as...”), open it in Ableton, and click on the Solo buttons to make A/B test. Fellow producers out there, how would you make your bassline more punchy? First of all I want to congratulate you for your page, just I have known and I think magnifies your work, I have many years listening to psychedelic trance and producing few years. I would like to have advice on correct equalization of a bassline, for example I have a bass in E-minor, consisting of two sounds from Trillian, which would be the low-middle and other sound top with a small noise Lo-Fi type, and I would like to know how to properly equalizes the low-medium hand, in the lower-middle and cut with a low-Pass 12dB at 30Hz part and a Hi-pass above 800Hz. Around 82.4hz I enhanced a little with a narrow Q and reduced frequency around 164.8hz with a narrow Q, and really sounds good but I facinaria know if I’m actually doing the right thing. Good questions here. Equalization is probably the most common type of audio processing, and also one of the most controversial topics especially when it comes to equalization of a bassline. Let’s clarify one thing before we’ll move forward. There is no such thing as “correct bassline equalization” because it’s a matter of your goals, preferences and sub-standards: some basslines are dull and darker, while others could be punchy and clear. Do you like the outcome? Then you’re doing the right thing! As you see there are different EQ techniques even within the every narrow sub-genre. So when talking about bassline equalization, we have to keep in mind specific reference, or result that we’re trying to archive. Nevertheless, I’ll try to tell some general guidelines. In general, I would advise trying to get desired sound before applying EQ. This alone is probably one of the most important things. For example, if a bassline sounds too bright while you’d like to keep it darker, you might want to put an EQ with High-shelf or even High-cut filter. But maybe you just need to slightly close the Cut-off filter envelopes in that particular synthesizer where the bass sound initially comes from? I’m not saying to completely skip the equalization, but sometimes it is not that really necessary. EQ changes the wave shape, altering its timbre and harmonics, so keep in mind that too many EQs on top of the other audio processing devices in the chain can make your bass sounds over processed, and also cause phase issues. Okay, let’s take a look at your particular case. You said, your bassline is in E key, and you “reduce frequency around 164.8 Hz with a narrow Q”. I’m not sure if this is what you’re tried to achieve, but in fact, you have reduced one of the key harmonics, which I would not recommend to do. So rather than cut these frequencies off, usually I’m doing vice versa: I gently boost 3rd and 4th harmonics for about +2 to +4 dB to slightly emphasize the root key of the bassline. Sometimes I even cut those frequencies from the kick drum to win some space for the bass. Then you saying that you cut above 800 Hz with a High-cut filter. Again, I don’t know what kind of sound you’re making, but I wouldn’t recommend to do it either. I’m actually doing the opposite: typically I gently boost a mid-high range of the bassline with a wide grip. Also, I prefer to cut those nasty frequencies at around 300~500 Hz to get rid of the “mud”, get extra clarity and make it more punchy. This also gives more room to other instruments in the overall mix. Basically, I’m not an audio engineer and definitely not consider myself as the most experienced music producer, so I came to an expert to help answer your questions. “EQing depends on from material you are working with, but some general guideline for balancing the two would be ‘where the kick thumps, the bass ducks’, this way you preserve the weight of the kick and clarity of the bass. If boosting of some frequencies is needed just to add more clarity, you can try the area around second harmonic of the bass (low-mid’s) and mid range of the kick, usually not more than +3 dB. Milos Modrtinic is a half of Sideform and Makida projects. I hope that helps. Other producers out there, feel free to share your bassline equalization methods in the comment box below, how do you treat it? What are some good techniques to get that deep bass sound that I hear in a lot of tracks by artists such as yourself, Lyktum and E-Clip? Specifically how do you go about synthesizing one (also what are common synths used) and what extra processing that goes on top of the raw synth sound. Lastly do you bounce the sound to an audio file once you’re happy with it and edit it further there or do you keep it as a midi file the entire way through the track creation. 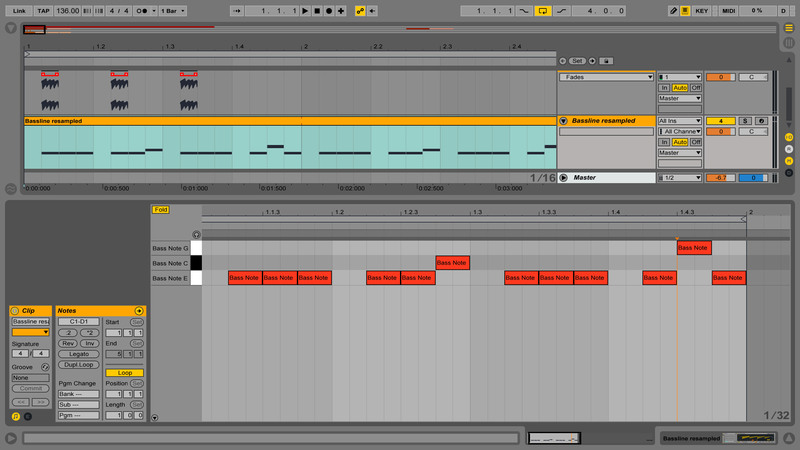 Lastly you may want to edit this out but do you teach music production over Skype? Ah, the bassline. How many thrill in this word among music producers! Some producers seem to think they own a certain sound, but those sounds had been used since the 80s, using pretty much the same technique. Jack, I cannot speak on behalf of E-Clip or Lyktum, so I’ll tell the way how I do the bassline. Formally speaking, the bassline is one of the simplest sounds in Psytrance music. Unlike of Dubstep bass, for instance, where you need a plenty of modulations, canonical Psytrance bass requires much less. Basically, all you need is just a few building blocks of synthesis: single oscillator, filter, and envelopes. You can use pretty much every synthesizer for this. So, let’s take initial preset of your favorite synth. 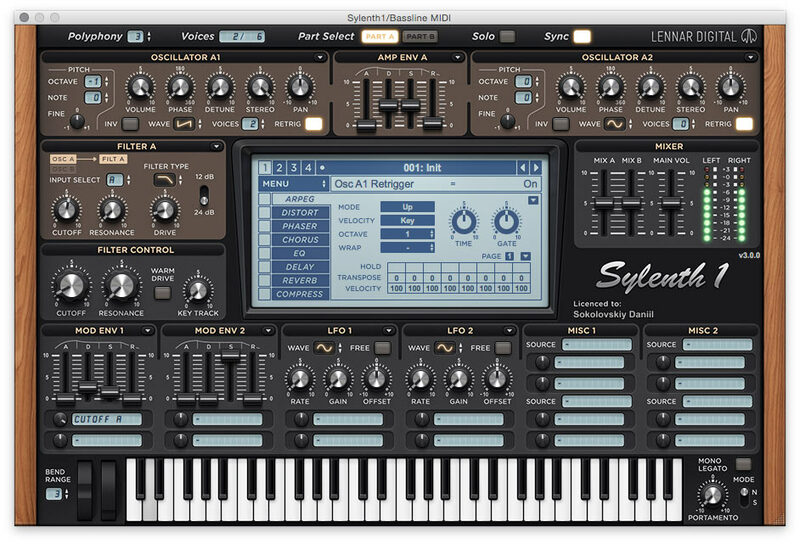 I’m using Sylenth1 (which, by the way, finally got 64-bit version support), but again, this is only a question of personal choice — you can recreate that bass in many other synths. For this demonstration purpose, I took some random kick from my samples library and placed MIDI-note of the bassline on note D1. Sounds very basic and primitive so far, but that’s okay. 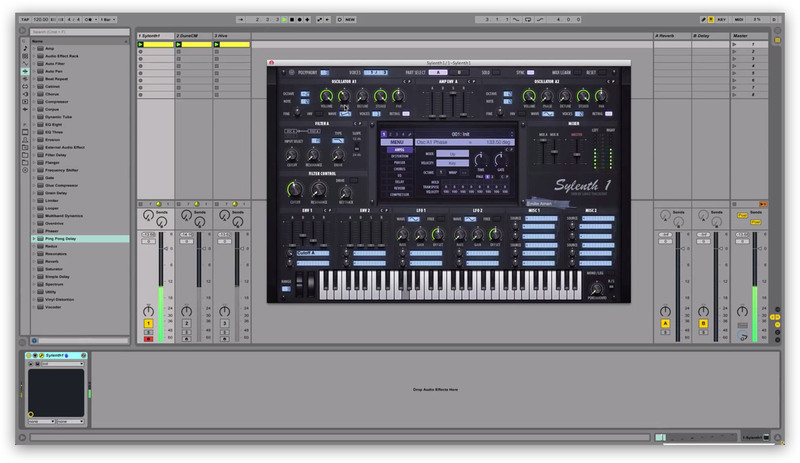 The first thing I gonna do is select Saw wave shape (Sylenth1 uses Saw by default, but other synths may use Sine or other shapes in their initial presets), and drop down the pitch by one octave down. If you use more than 1 voices in the oscillator, make sure that “Retrig” option (or whatever it called) is turned on — it forces all voices to start at the exact same location on the waveform every time a note is played; it prevents voices to be out of phase. Now I gonna apply Lowpass filter with 24dB attenuation per octave — it gives a slightly faster/sharper cutoff comparing to 12dB. Play around with cutoff frequency up to your taste. Then I gonna route filter cutoff to modulation envelopes. Now let’s take a look at ADSR. The bass sound should not have fade-in, nor fade-out — so we drop down Attack and Release parameters down to zero. Sustain would give a long “body” of the sound, which we no need here much either. 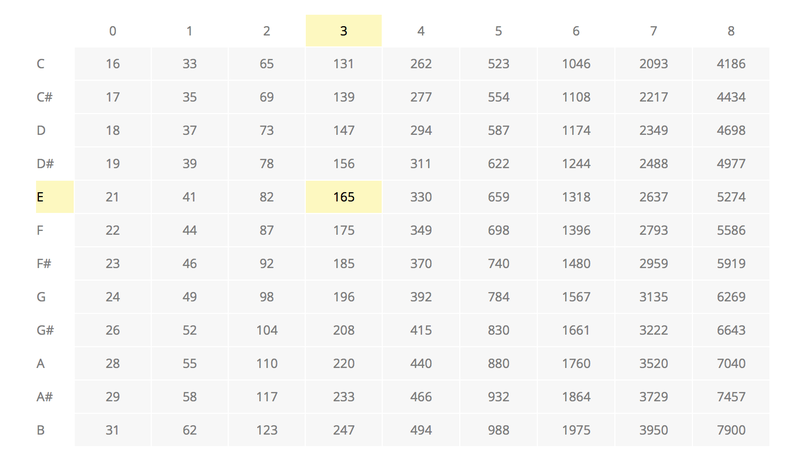 So the only parameter left to play around is Decay — I would give it around 30% of the maximum value. And pretty similar settings to oscillator envelopes. This is it — the essential foundation. Tiny details could be tweaked further up to your taste, but I satisfied so far. Skipping to one of your question ahead, — yes, I do bounce the bassline. This is also called resampling. Different DAWs requires different actions to make resampling, but the general idea is to change, to “bake” our bass from MIDI into solid WAV state. I believe, it gives more consistent sound, more predictable and aggressive velocity. Also, it may save your CPU if you experience a lack of performance. 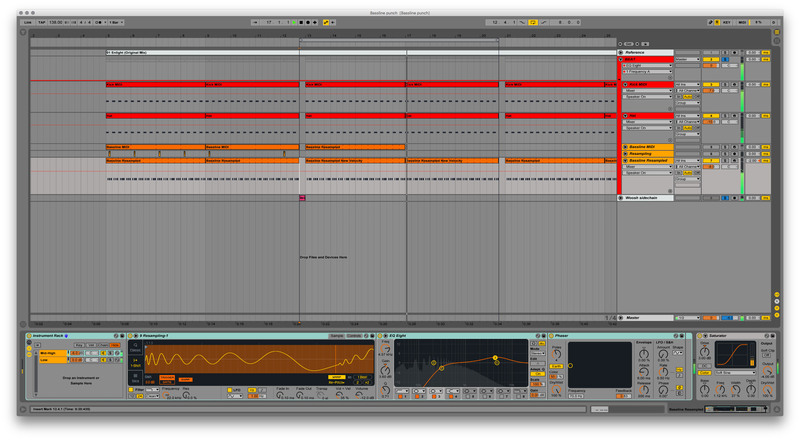 Once a single bass note is resampled, I put that sound into Sampler, and then build a desirable bassline pattern. 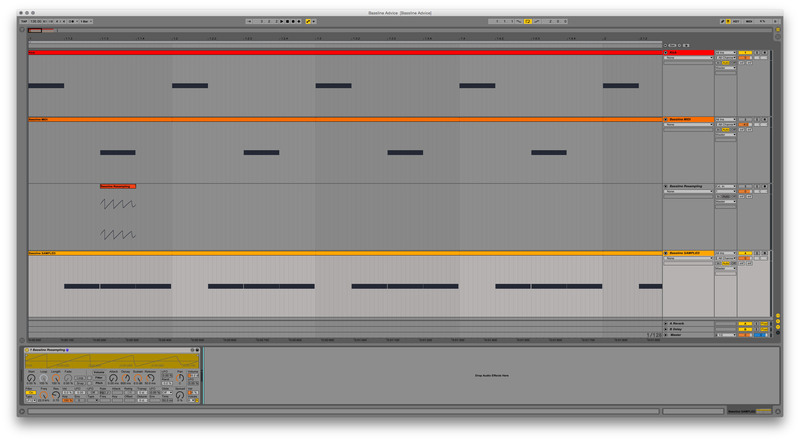 So it goes like this: MIDI → resampling of single note → resampled piece of sound into Sampler. As you can see, I have three tracks here. I do recommend to keep your original MIDI bass, don’t delete it, just leave it muted or “frozen”: you might want to go back and change something in the source. Quite nice, but need to EQ it a little bit. Usually, I remove that kind of “mud” at around 300 Herz and gently boost lower harmonics. Since I’m using the note of “D”, the harmonics will be at 73 and 147 Hz. This is it. You can also play around with velocity, and give some “character” to bassline by adding a pinch of distortion, compressor, or any other device up to your taste. Remember, this is not a ready-to-use recipe (although, you can use it), but rather I would like to give understanding of the process, so you could create a bass that suits your needs, with a personal touch. Lastly, — no, I don’t teach music production over Skype, although I do realize it might be even profitable. The purpose of the “Advice” series is to make mechanisms of music production and industry a little bit more transparent and easier to understand. I would like to make this knowledge wide open, hence why I prefer blog posts rather than personal talks in Skype.